The composites industry is facing growing environmental pressures. As the industry continues to grow and the volume of fibre reinforced plastics (FRP) used increases, so will both production scrap and end-of-life waste. The total combined volume of end-of-life and production waste generated by the glass thermoset composites market in Europe is expected to reach 304 000 tonnes by 2015, reports Fons Harbers, Chairman of the European Composite Recycling Services Company (ECRC), an organisation which has been promoting FRP waste recycling for around eight years. Several presenters outlined the advantages and disadvantages of current options for the disposal of FRP waste. Landfill is a relatively cheap disposal route but it is the least preferred waste management option under the European Union (EU)’s Waste Framework Directive. Landfill of composite waste is already forbidden in Germany and other EU companies are expected to follow this route. Incineration is another common method of disposal of FRP. However, in this process around 50% of the composite waste remains as ash, and this has to be landfilled. Moreover, incineration is not always possible (where limits are imposed on the energy content of the waste), it is not suitable for large parts and glass fibre residue can cause process stoppages. The cost for landfill and incineration is also expected to increase over the coming years. Many initiatives have looked at the mechanical recycling of glass fibre composites. In this route, the waste composite is broken up and then ground into small particles. The resulting mixture of fibre, polymer and additives is then re-used in other products. A range of applications for this waste have been investigated. These include its use as a filler in sheet and bulk moulding compounds (SMC/BMC) and in asphalt and concrete reinforcement. Organising a viable collection/transportation/processing system for the waste and finding sufficient outlets for the recyclate are two barriers to this approach. A number of processes which recover the fibre and resin/chemical content of the original composites are also being developed, but these tend to be more complex and expensive. 33% energy recovery: the organic part of the composite (resin) is used as a substitute fuel, enabling savings to be made in the use of other (fossil) fuels. This is a relatively simple and cheap solution, with a 100% recovery rate (no ash is produced as in the incineration route), but the composite waste needs to be reduced to a small particle size and formulated to make it suitable for use in the cement kiln. An industrial scheme following this route is now in operation in Germany. 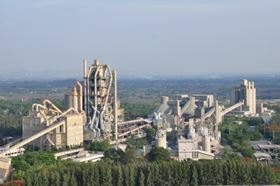 It is a partnership between Zajons Zerkleinerungs GmbH, a recycling business located in Melbeck, and Holcim, a leading Swiss-based cement group, which is introducing the ‘co-processing’ of various waste materials as ‘alternative fuels and raw materials (AFR)’ into its plants worldwide through its Geocycle business. Jörg Lempke, Managing Director of Zajons Logistik, explained how the company’s CompoCycle composites recycling business started in 2009 with a project to dispose of large wind turbine blades and the setting up of a partnership with Holcim in Germany. In 2010, Zajons gained approval for the construction of a processing plant with a capacity 60 000 tonnes/year, involving an investment of €6 million. Taking the example of composite wind turbine blades, the end-of-life blade is first cut up using a mobile saw into pieces that can be transported by a normal sized truck. After they are transported to Zajon’s Melbeck factory the composite pieces then undergo several other cut, shredding and grinding operations and separation of secondary raw materials to produce small particles (<60 mm) which can be used in the cement plant. From Melbeck, the material is taken to Holcim's Lagerdorf cement plant, which gained permission to use rotor blades as alternative fuel and raw material in 2009. Here the composite waste is mixed with a second fuel fraction and processed in the cement kiln. Holger Krahmer, Member of the European Parliament (MEP), Committee on Environment, Health and Food Safety, gave the keynote presentation at the event: Political decisions with relevance for the composites industry. Read Holger Krahmer’s speech in full here. Jean-Pierre Degré, Senior Vice President, Holcim Group Support, Sustainable Development – Alternative Resources, confirms that co-processing of FRP waste as alternative fuel at the Lagerdorf cement plant has no negative effect on the quality of the cement produced. CompoCycle scheme is a voluntary scheme. Companies wishing to dispose of their GRP waste enter a license agreement with Zajons and they can use the CompoCycle logo. Zajon’s Lempke says the cost is around €114 per tonne of waste, but costs to transport the waste from the producer to the Zajons plant must be added to this. The Information Day on Competitive Composites: Sustainability and Recycling Challenges was organised by EuCIA with the support of the Alliance of Liberals and Democrats for Europe and EuCIA’s media partner Reinforced Plastics magazine. The presentations from the day are available free of charge to EuCIA members and available to purchase for non-members. This article was published in the May/June 2011 issue of Reinforced Plastics magazine. Composites UK, working with the Universities of Nottingham, Manchester and Birmingham, has launched a new report on composites recycling.